Union Station in St. Louis, home to the FOG Software Group User Conference next week. Look for A+W in St. Louis next week where the company will take part in the FOG Software Group User Conference. 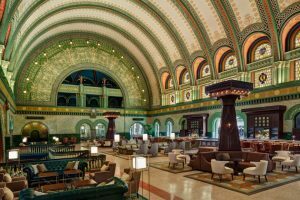 Held at the historic Union Station hotel downtown, the four-day conference is an opportunity for software executives and their customers to have face time where they can help direct the future of their products. Speakers, brainstorming sessions, and networking events will stretch over the four days, April 30-May 3. Besides A+W, other FOG Software Group companies attending are Friedman, Varsity, Cadre, Argos, and Logimax. For more information, visit FogSoftwareGroup.com. Don’t forget to check this space for news from St. Louis!